Photo: Prime Minister Narendra Modi is addressing the gathering during the inauguration of National Museum of Indian Cinema in Mumbai on January 19, 2019. Photo: Prime Minister Narendra Modi during the inauguration of the National Museum of Indian Cinema in Mumbai on January 19, 2019. 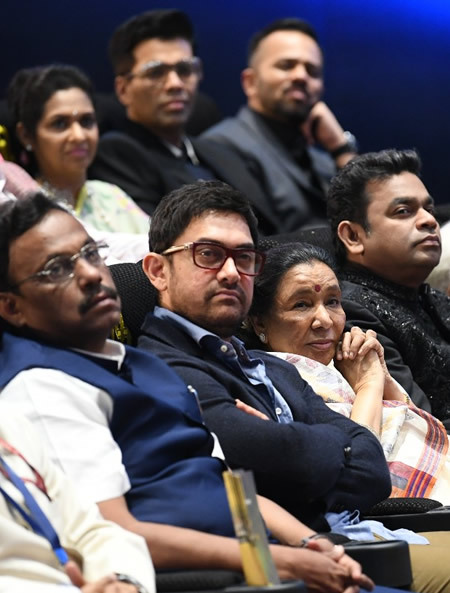 Photo: Dignitaries during the inauguration of the National Museum of Indian Cinema in Mumbai on January 19, 2019. 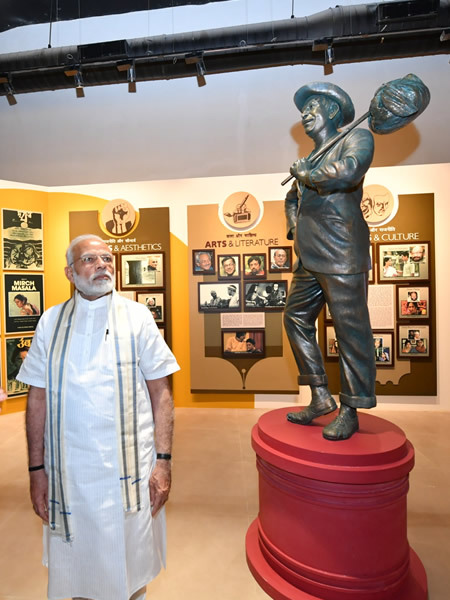 Mumbai, January 19, 2019 — Prime Minister Narendra Modi inaugurated the National Museum of Indian Cinema in Mumbai today. Many dignitaries were present at the event. 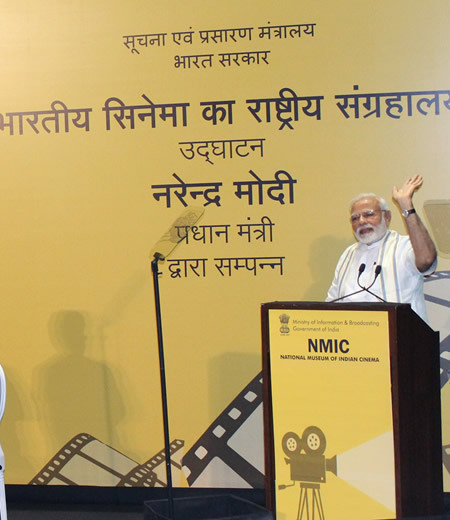 In his address, the Prime Minister said that the National Museum of Indian Cinema would provide a fantastic opportunity for the younger generation to understand and learn about Indian cinema. He added that the Museum would have detailed information about the history of the Indian entertainment industry along with tales of struggles of various film personalities. Mr. Modi said that film and society are a reflection of each other. Whatever happens in the community is reflected by the movies on the screen, while the community mirrors the images from the films. Talking about trends, he said there are many films now which depict both the problem and the solution which is a positive sign as compared to earlier years when only the helplessness was displayed. Mr. Modi said that India is now confident of finding its solutions to the problems it faces and this he said is a sign of a New India which is confident and capable of taking issues head on and resolving them. The Prime Minister in his address highlighted the global reach of Indian Cinema. In this context, he mentioned his interaction with various global leaders who can even sing Indian songs. The Prime Minister said that the Indian Cinema has a significant role in enhancing India’s soft power, its credibility, and building Brand India across the world. He said that through Cinema, critical social issues such as sanitation, women empowerment, and sports are now reaching to the people. 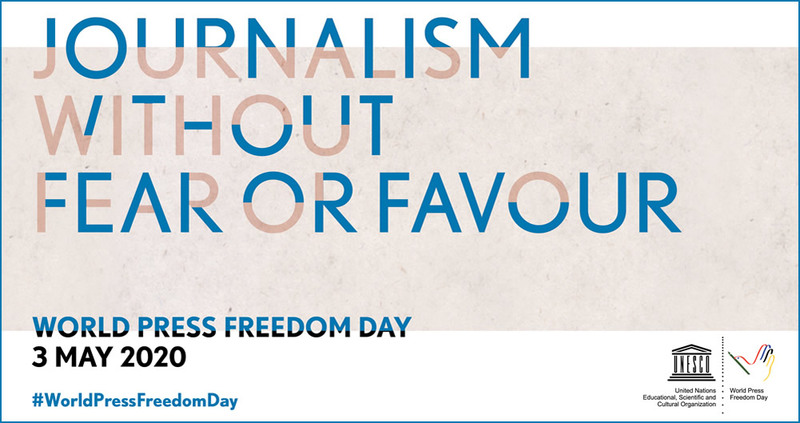 Cinema plays a vital role in nation building and strengthens the feeling of Ek Bharat Shrestha Bharat. PM said that the film Industry has a vast potential of contributing to the growth of tourism in the country. He mentioned that the government is working to provide the facility of ‘Ease of Filming’ by putting in place a Single Window Clearance system for Film Shooting approvals in different parts of the country. Prime Minister said Government is working on amending the Cinematograph Act 1952 to check the problem of Film Piracy. Mr. Modi said that the government is also working towards setting up a National Centre for Excellence for Animation, Visual Effects, Gaming, and Comics. Narendra Modi said that a dedicated university for Communication and Entertainment is the need of the hour and urged film personalities to suggest and contribute on this. He also suggested the idea of Global Film Summit similar to Davos Summit which would focus on the expansion of the market for Indian Cinema.